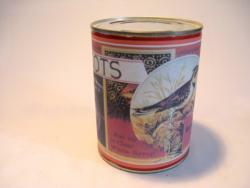 WW1 Reenactments Equipment : Great War Tommy WW1 Food Rations Labels : Bird Brand Californian Apricots label. WW1 Reproductions and WW1 Reenactors Equipment / Kit - Bird Brand Californian Apricots label. "Bird" Brand Californian Apricots label. Very ornate "Bird" Brand Apricots label by the Santa Cruz Packing Co. of San Jose and typical of canned fruit sourced from the advanced U.S canning industry.